When my sister was a bit younger, she used to be quite fussy with her food. She didn't like any seafood, nor did she like spicy food so family dinners could be quite limited. Nowadays she's much better and eats pretty much everything (even spicy food!) so enjoys this too, but there was a time when Mum used to make this for me as a spicy treat when my sister was out. I don't know the origins of this one, and when i asked my mother she said she couldn't remember either. 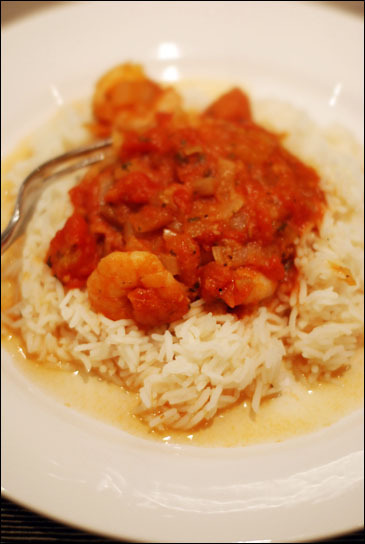 However, it's one of my favourite quick and easy recipes and is a good store cupboard meal, should you have frozen prawns and chopped tomatoes to hand. It takes no more than half an hour, and the tangy tomato sauce with a hint of chilli and prawns is absolutely delicious. First, fry the onion until soft in about a tablespoon of olive oil. Then, add the cumin, coriander and garlic and fry for a further minute. Add the chopped tomatoes, chilli powder, white wine, lemon juice, salt and pepper, and simmer slowly to reduce. While the sauce is simmering, put the water on for the rice and bring to the boil. Lightly salt the water and once boiling, add the basmati rice and boil for about 11 minutes. As the rice cooks, keep an eye on your tomato sauce to make sure it doesn't reduce too much - you don't want it to boil dry. If it does cook a little too fast, just add a little water to the sauce. 5 minutes before the end, add the king prawns. Drain the rice and allow to stand for a minute or two, then fluff it up. Put a couple of spoons of rice on each plate, hollowing out the middle to create an 'O' shape. In the middle of the 'O', put a couple of spoons of tomato sauce, and serve.